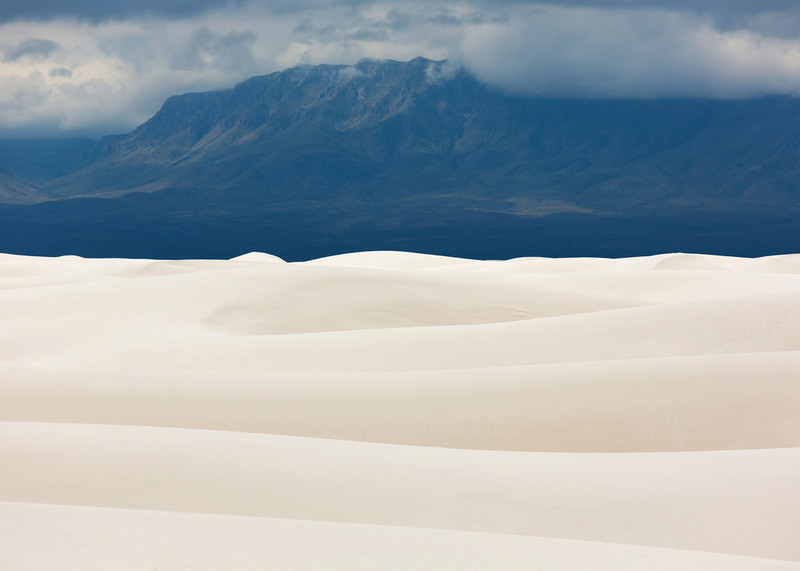 I may have been even more excited to visit White Sands than I’d been to see the Albuquerque Balloon Fiesta. 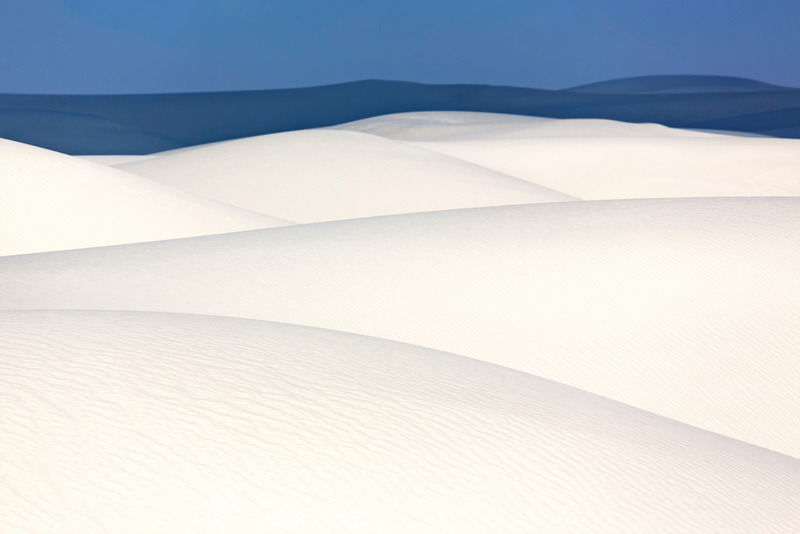 I love photographing sand dunes, and the dune field at White Sands National Monument is unique. 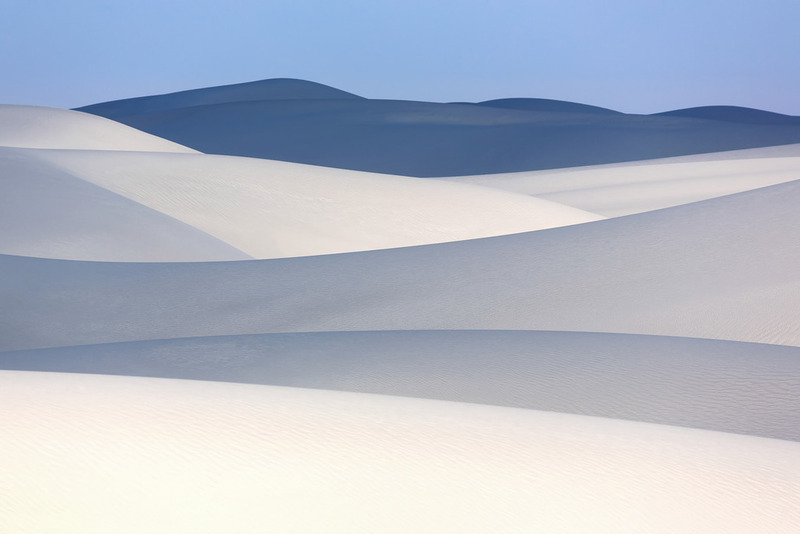 Ordinary dunes are composed of tiny grains of quartz, but White Sands is gypsum-based, which makes it white. 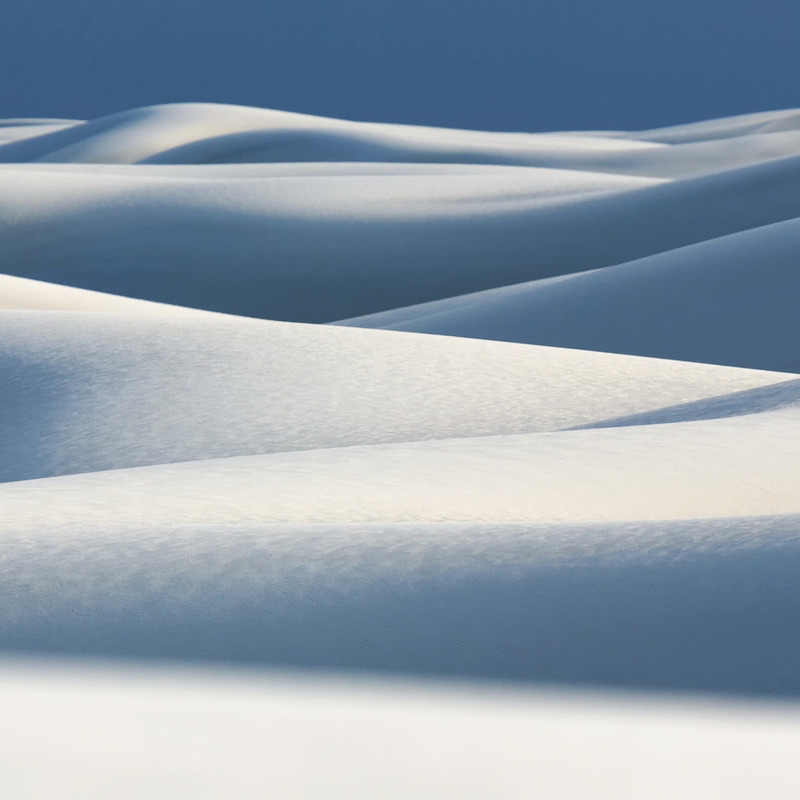 It’s the largest white dune field on the planet, by far. On the way from Albuquerque to White Sands I passed the entrance to the Trinity site, where the world’s first atomic bomb was detonated in 1945 as part of the Manhattan Project. 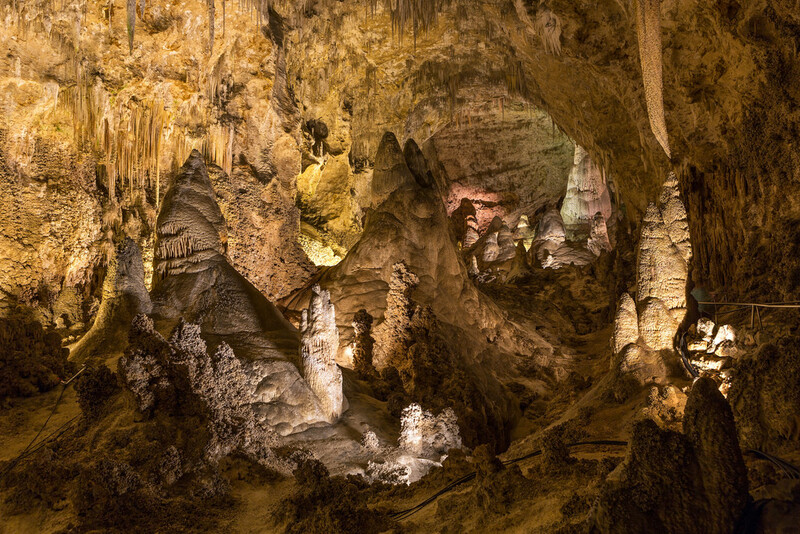 It’s now a National Historic Landmark that’s only open to the public on the first Saturday of April and October each year. Seventy years after the explosion, radiation at the site is apparently still 10 times higher than normal. The weather had me worried. Scattered storms were moving through the area and the forecast called for more of the same. 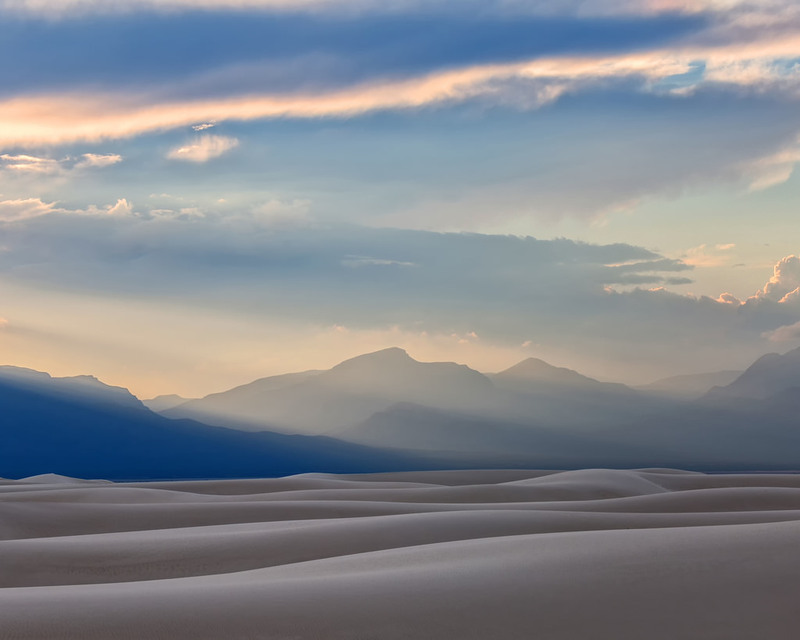 I welcomed some clouds to add character to the sky and create interesting shadows on the dunes, but a solid layer of gray would flatten all the light and make for boring photos. 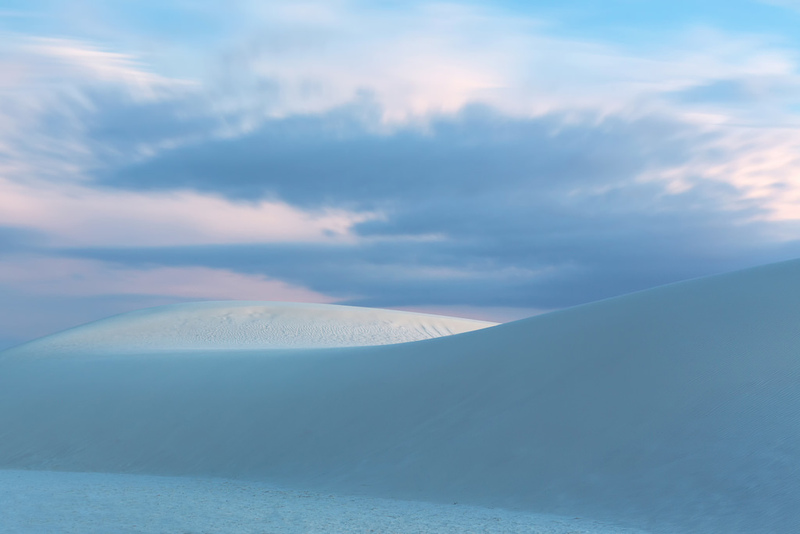 I planned to hike around White Sands that afternoon and then return again tomorrow for sunrise photos. 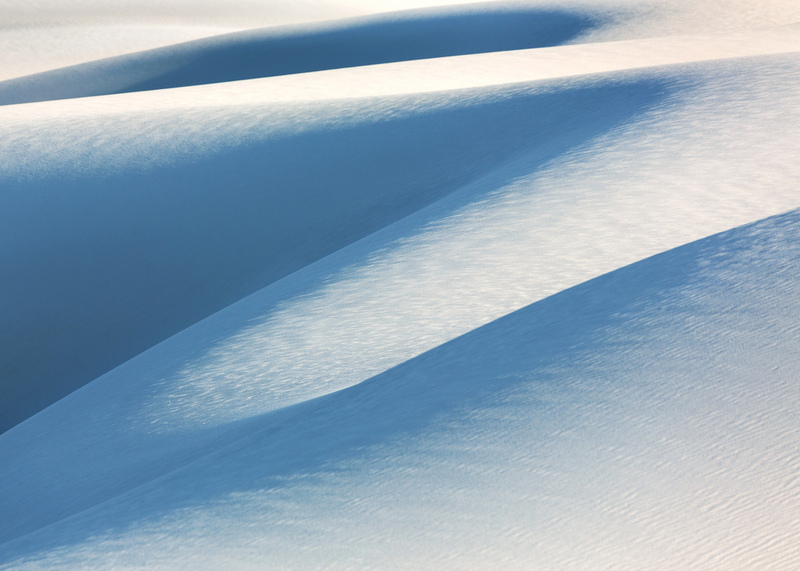 The sun was completely blocked when I arrived at mid-day, but it was still a thrill to walk out onto the dunes for the first time and be surrounded by their beautiful, unusual whiteness. 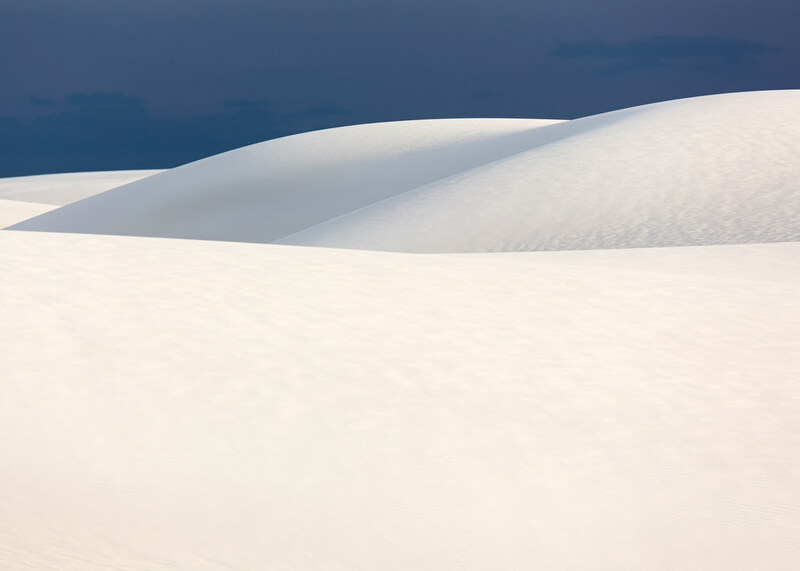 In the late afternoon I hiked out to an area that hadn’t been marred by footprints. 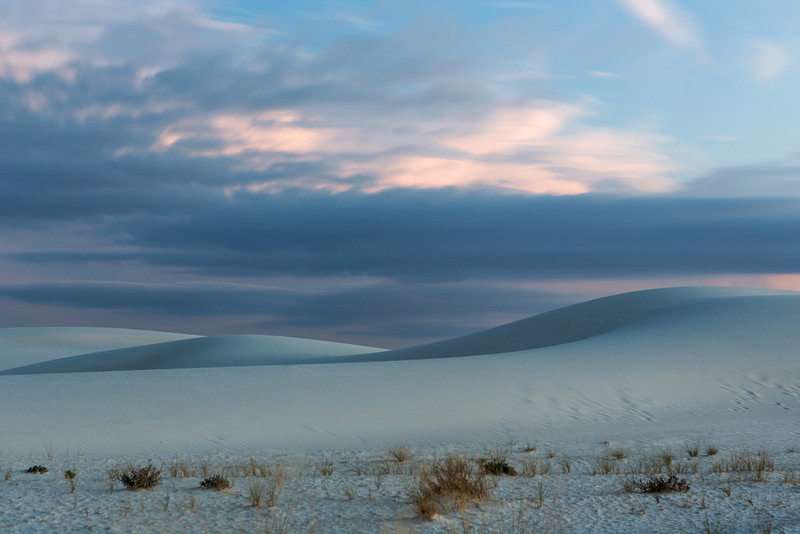 On my way I passed a group of backcountry campsites within the dune field, an option I hadn’t realized existed. How had I missed that? 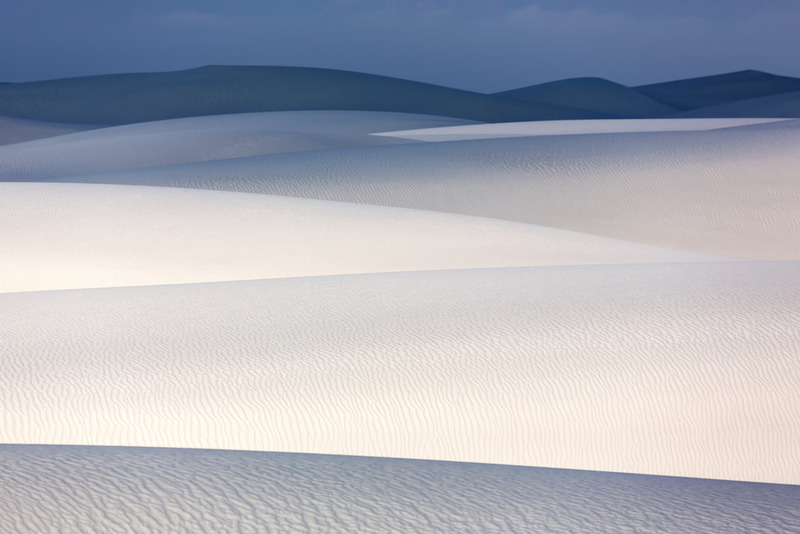 If I’d camped there that night, I could have stayed past White Sands’ 7pm closing time and been out on the field for sunrise photos well before the gates opened again at 7am the following morning. I made a mental note for my next visit. Blue patches eventually appeared among the clouds and direct sunlight began to break through. Conditions were almost ideal for photos. 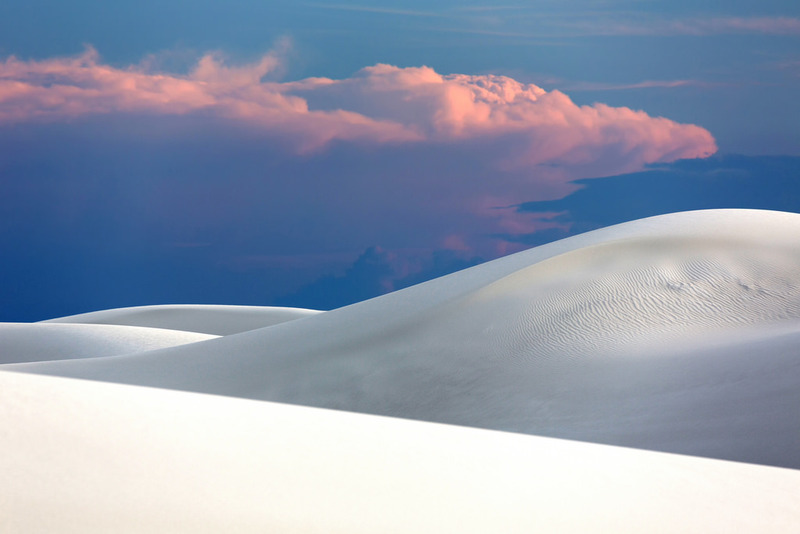 The white sand practically glowed in the soft afternoon light, and the mix of sun and clouds cast ever-changing shadows on the dunes. I took a minute to be grateful for where I found myself. 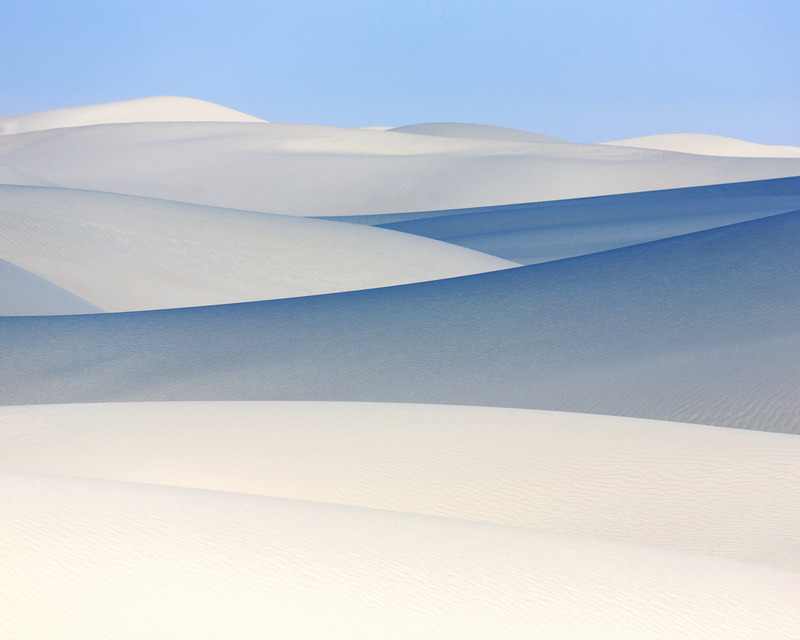 Curving lines of ethereal white sand stretched in all directions. The light created amazing scenes everywhere I looked. The aggressive heat of the afternoon had mellowed into a pleasant warmth. 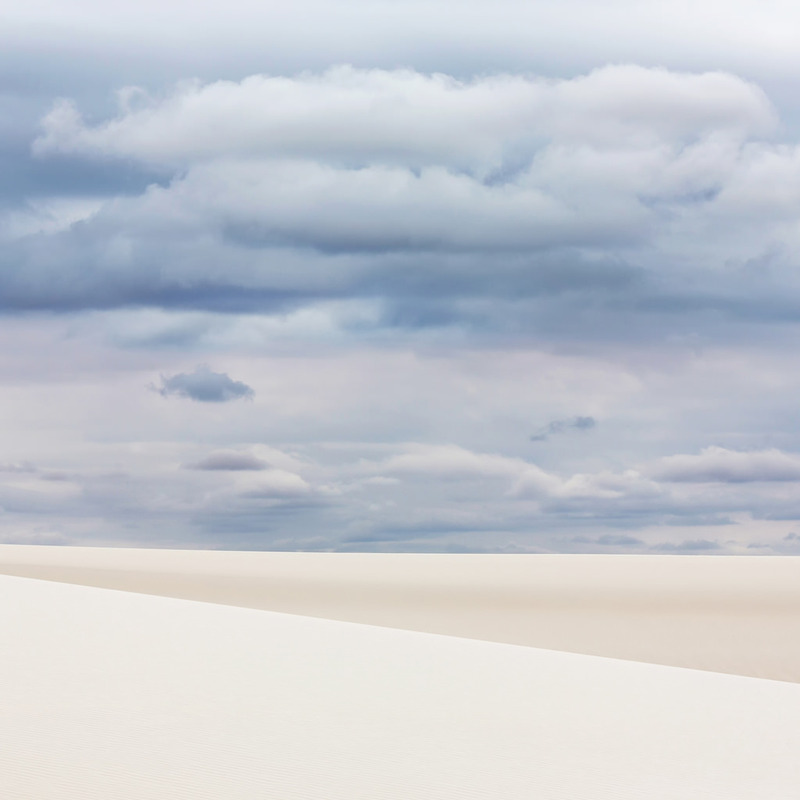 Two other photographers were small dots on the horizon, but other than that I had a huge section of the dunes to myself. At that moment I was exactly where I most wanted to be. 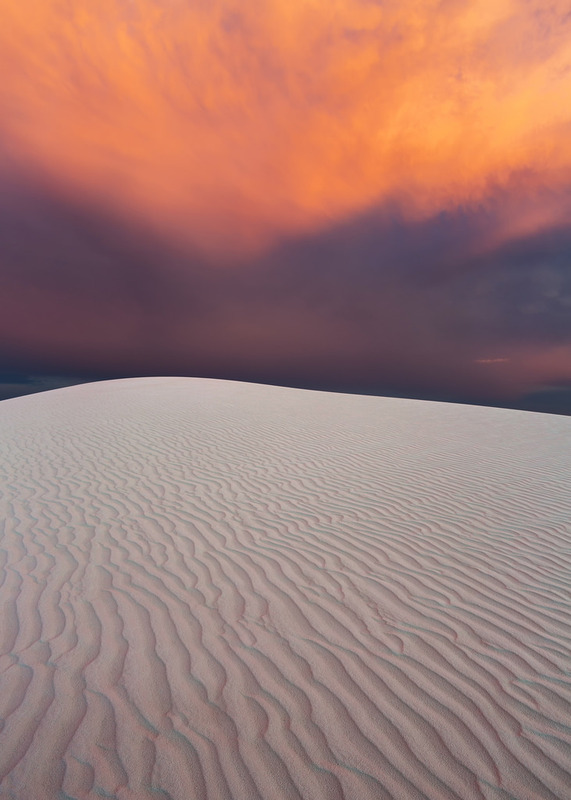 Sunset color began appearing in the clouds and eventually grew so intense that hints of orange and pink were reflected in the white sand. It was a mesmerizing show. 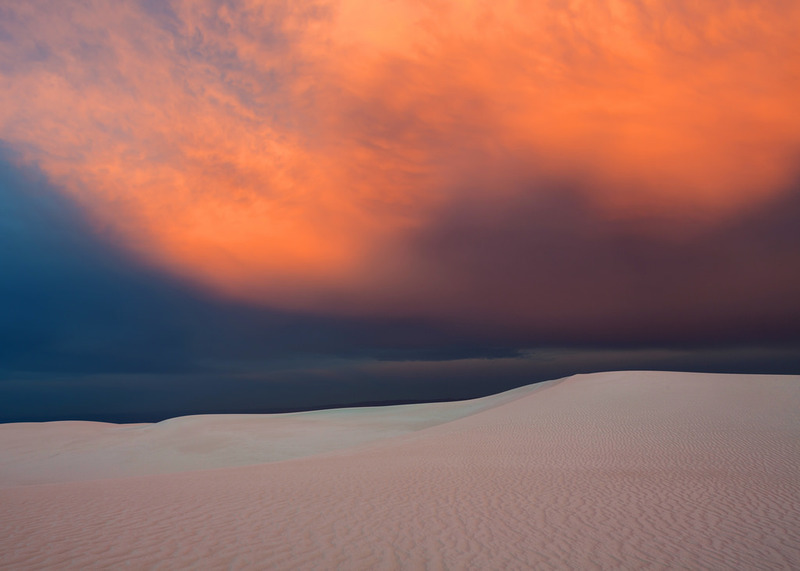 After what felt like a long time the light faded and I forced myself to leave the dunes. 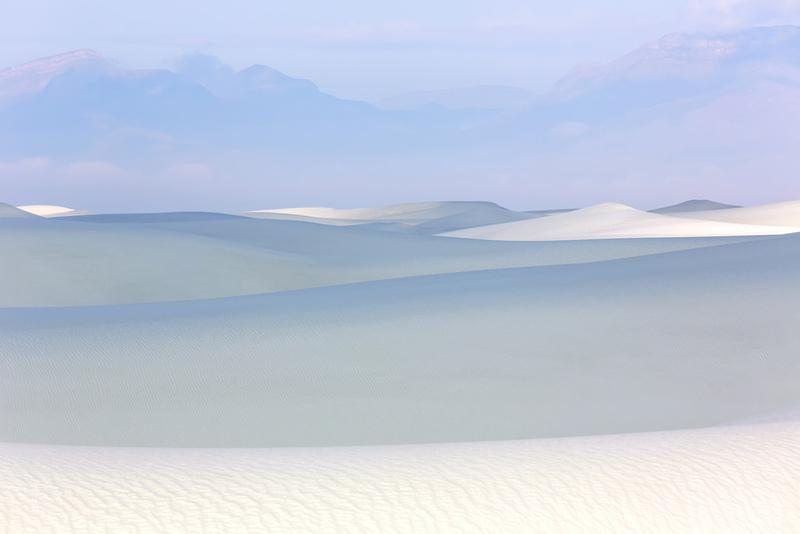 Signs said White Sands didn’t open until 7am, but the next morning I arrived at 6:30 in case they let people in earlier. They didn’t. At exactly 7:00 a park ranger opened the gate. 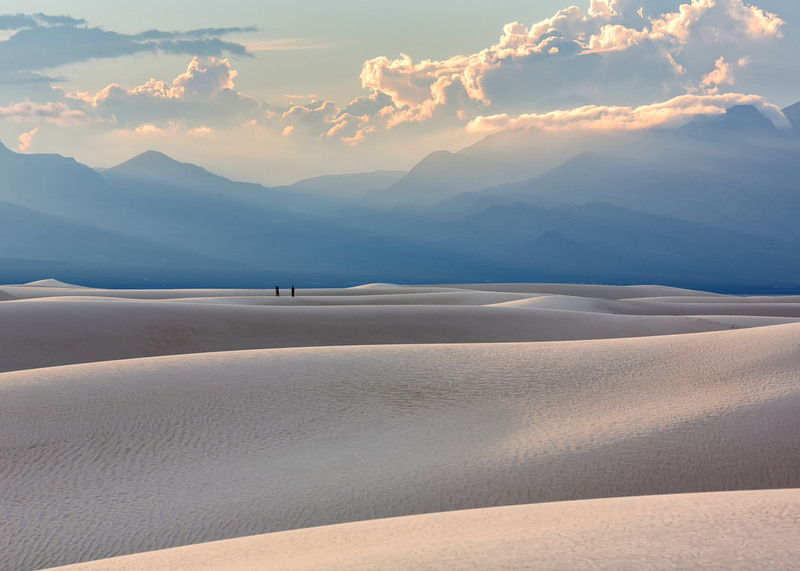 I drove well over the speed limit on the road that led the dunes, but I was tailgated by a car in an even bigger hurry. 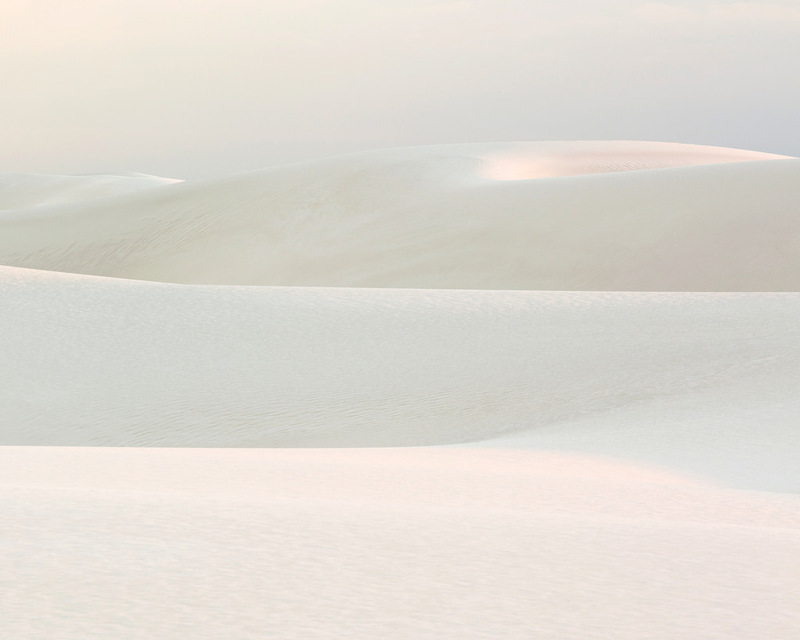 I pulled aside to let it pass, guessing that the driver was a photographer who was as anxious as I was to get out on the dunes before first light. 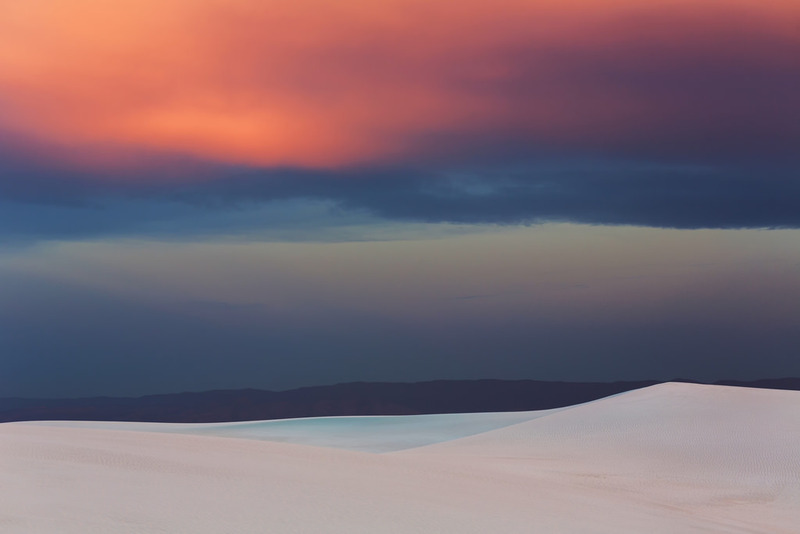 The driver and I parked at the same trailhead, and sure enough – he grabbed a camera and tripod and ran onto the dunes just ahead of me. 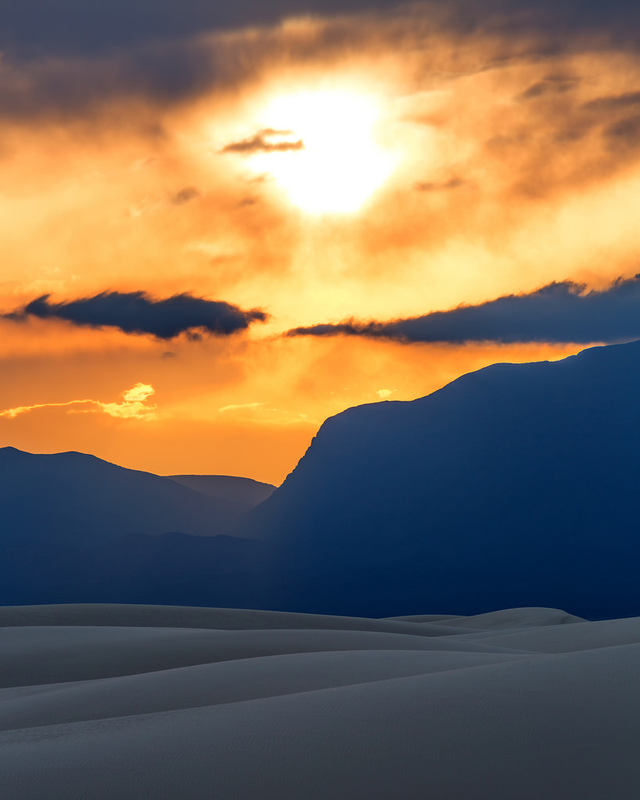 Sunrise on the dunefield was incredible, again a mix of blue sky and clouds. I only wish I’d been able to get out there a half hour earlier. 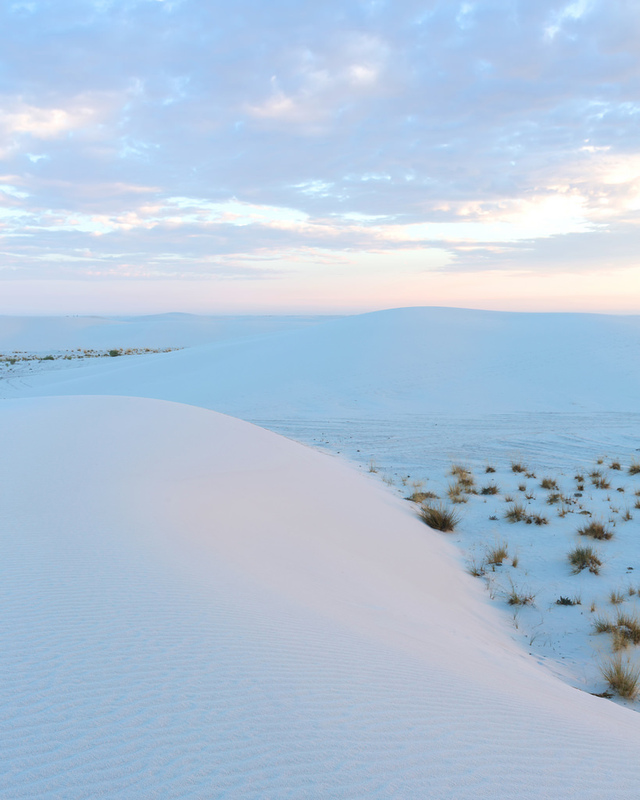 I hated to leave White Sands, but I looked forward to my next stop at Carlsbad Caverns National Park. I’d visited once before, back in 2006, but at that point I hadn’t learned how to properly take long exposures and I wasn’t happy with my photos. I figured it would be easy to do better this time. Turns out it wasn’t. 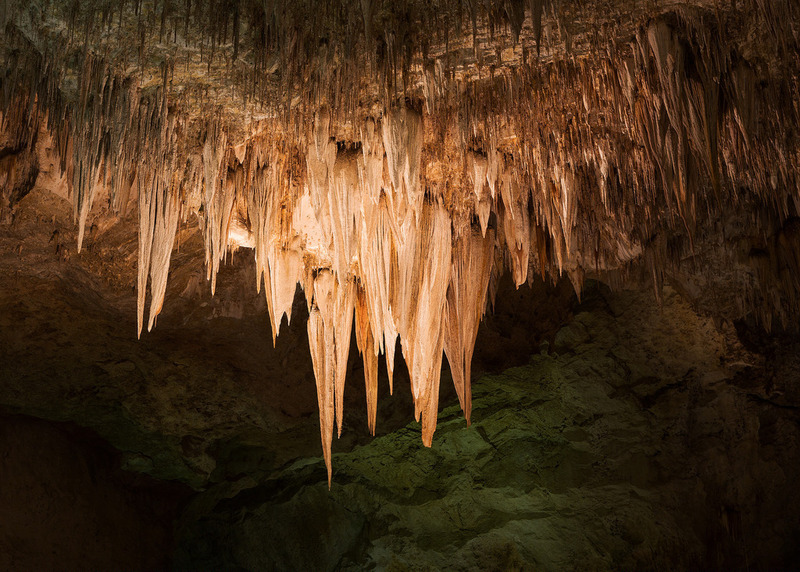 It’s just tough to get exceptional photos down there. All the light is artificial, obviously, and static. Perspectives are limited because you have to stay on a set walkway. 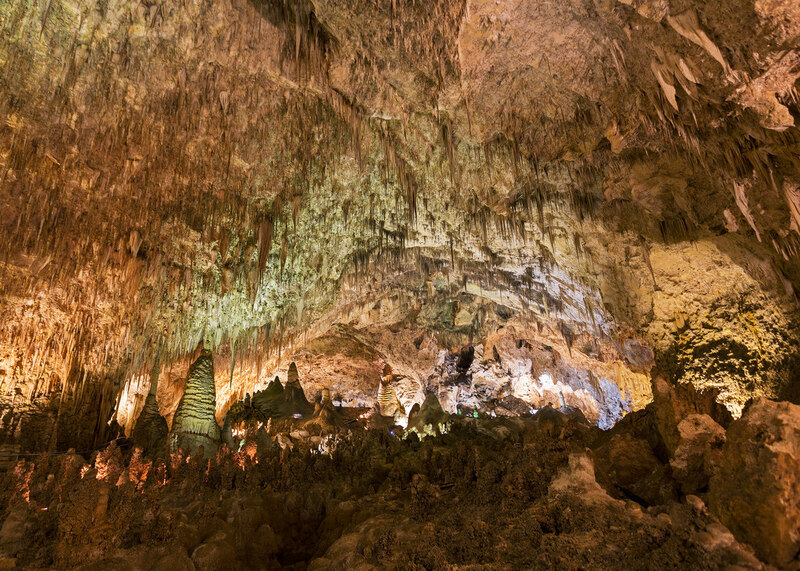 And part of the wonder of the caverns is the immensity of it, which photos – mine, at least – don’t really seem to capture. My shots from this visit weren’t much better than my shots from 2006. 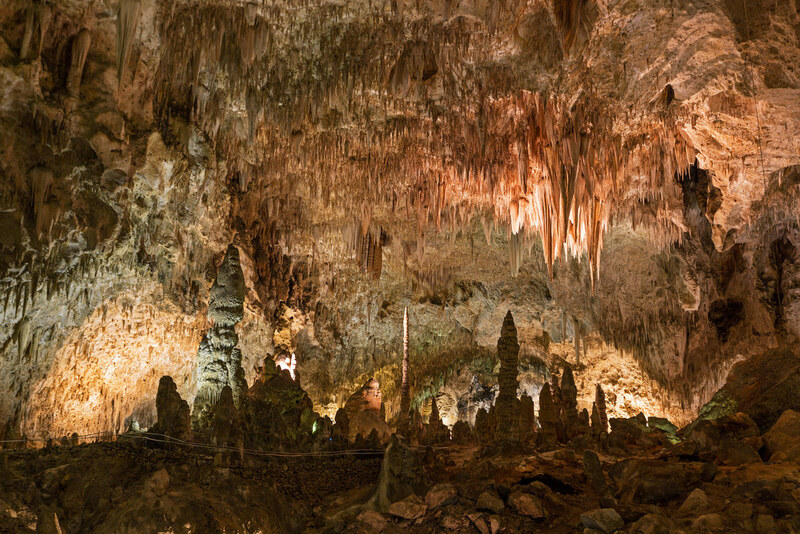 Still, the place is genuinely amazing and I really enjoyed spending a few hours down there. This is my trip for next week! I am really excited about it, thank you for all the great source of ideas!